Classic Radio Fans! Join Carl Amari and Lisa Wolf on an incredible 7-night Eastern Caribbean Cruise! 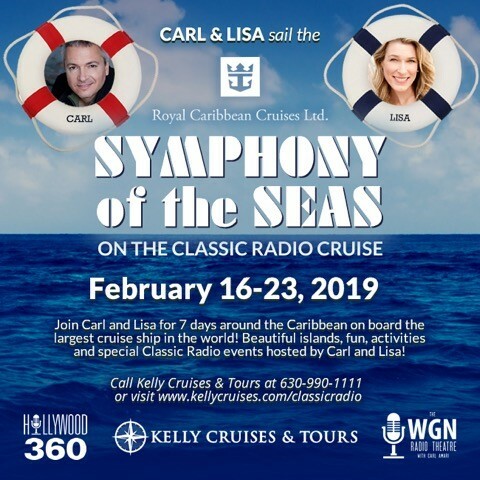 We will sail the Caribbean islands February 16th-23rd on Royal Caribbean’s newest ship, the Symphony of the Seas — the largest passenger ship in the world! This amazing vessel is a destination-in-itself with 7 neighborhoods, over 30 bars and restaurants, award winning shows like Broadway’s Hairspray, and even the world’s tallest slide at sea. Hang out with Carl and Lisa and join events exclusive to our group including a cocktail party, trivia contest and more surprises. This experience truly has something for everyone: the young and the young-at-heart, foodies, adventure seekers, night owls, music lovers, beach bums and of course Classic Radio Lovers!